The City of Angels is fast becoming a city of river enthusiasts thanks to a confluence events: the recognition and protection of the Los Angeles River as a navigable waterway by the United States Environmental Protection Agency under The Clean Water Act; the environmental activism of citizens' groups like Friends of the Los Angeles River and Heal the Bay; and, events to open access to our precious river resources by groups like L.A. River Expeditions and the Los Angeles River Revitalization Corporation. Mark your calendar for Aug. 30, 2014: the Inaugural Los Angeles River Boat Race--an historic opportunity to become part of this rediscovery of Los Angeles's founding river. You are welcome to race in a canoe, kayak or on a stand-up paddle board (SUP). The entry fee is "pay what you can," with the main goal is to get the people of Los Angeles to realize that a river runs through us, and it is a lot of fun! Here is a link for signing up which includes an option for LA River Expeditions to provide your equipment: boat, paddle and safety helmet. Other sources for rentals or purchases of equipment before the race include LA River Kayaks, the official rental vendor along the Glendale Narrows, Action Watersports in Marina del Rey and Sports Chalet in Burbank. Craigslist also has cheap used canoes, kayaks and Stand Up Paddleboards (SUPs). Still can't imagine a race in the L.A. River that doesn't involve cars, motorcycles and a film crew? Too strange to be true? Here is more about the race from George Wolfe, the founder and president of L.A. River Expeditions, the event organizer. Q: How did the idea for this unique event start? George Wolfe: Our guides and other staff love paddle sports. Many are nationally-certified kayak and rescue instructors. Some have competed in slalom racing too, and understand the noncompetitive community that builds around such competitive events. L.A. River Expeditions tries to get people out on the water for fun, for fitness and for education. It just made sense that we would be the right folks to start up an event that brings people together to use the river in a way that's never been done before. Our new Kayaking Cleanup Brigade, the first in-river cleanup effort of this kind, using citizen volunteers combined with our staff and environmental educators, is another example of how we seek to expand usage of the river. Q: Who are the organizers of this event? GW: L.A. River Expeditions senior staff, myself and long-time guides Anthea Raymond and Brendan Nelson. Both teach sea and whitewater kayaking and safety at UCLA and with the Los Angeles Kayak Club, which is bringing in an expert to explore how to make the riverbed more exciting for boating. 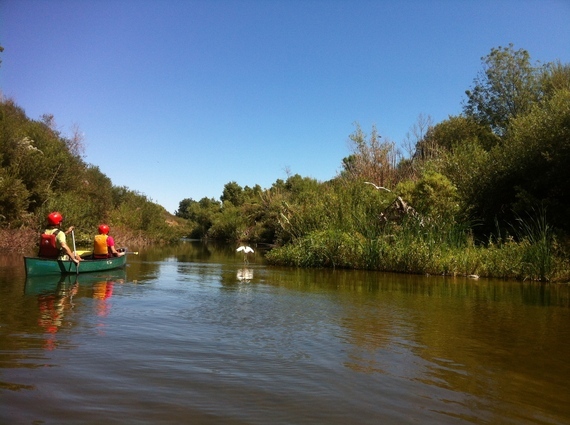 We are also hoping to recruit participants from other L.A. River outfitters and boating and youth organizations. Q: What kind of course are you setting up in the water? GW: Since this would be the inaugural event, we'll need to keep it simple and work with features that are already there. But there will be a course that participants have to navigate in order to get to the finish line. Q: Is this event family friendly? Can parents bring their children in to race or just watch? GW: Teens, 16 and over, can participate as well and we hope they will, which is a reason why we've just decided to make the event donation-based. We hope to include younger kids in future years. And, since we're going to need timers, starters, scorekeepers and runners, we hope young people will volunteer to help officiate the race! Contact Brendan Nelson (brendan.nelson@tvc.cbs.com) if you are interested. Q: What should people expect when they sign up for the race? GW: Everyone wins in the L.A. River Boat Race and we mean it. Folks will have fun while becoming further invested in the idea that this is, indeed, their river to use and to care for. And who knows, our little course might someday become a place for important sporting events that attract world-class athletes. Q: You say the race includes the LA River Kayak Race and the LA River SUP Challenge. What does that mean? GW: The course is the same for all craft, starting on a small rapid near Fletcher Drive, continuing down to flatwater near Marsh Park and then looping back on that same flatwater. Q: What do you hope people will get out of joining the race? GW: As with the guided trips that we've done since 2011, this event will emphasize that nature is right here, in Los Angeles. You don't have to drive three hours to find it. In fact, Los Angeles is home to lush nature juxtaposed with three freeways. Take that Yosemite!